MINNEAPOLIS — When couples don’t communicate about money, it’s akin to writing with invisible ink, say leaders of Better Halves™ (www.brightpeakfinancial.com/betterhalves), a workshop and small group program that helps couples understand the emotional and spiritual aspects of money. Better Halves™, which is part of brightpeak financial, will model its conviction that communication fosters better understanding of family finances during the 2015 Atlanta Catalyst Conference, Oct. 7-9, with the distribution of promotion-related invisible-ink pens. During the Better Halves™ Small Group, couples play a “secret spy” game where each person ranks their spending priorities with invisible ink. Later, a black light reveals their responses. brightpeak financial is a faith-based not-for-profit that empowers Christians to live with financial strength and generosity. The organization believes improved communication can reduce marital conflict that often emerges over finances. Thrivent Financial for Lutherans is its parent company. Through a partnership with PREPARE/ENRICH (www.prepare-enrich.com), Better Halves™ addresses the “crazy idea” that money is emotional, and it plays a significant role in shaping our behavior. Couple Checkup™ powered by PREPARE/ENRICH is an online relationship assessment tool that identifies unique relationship strengths and growth areas and prepares couples for the Better Halves™ Workshop. The Better Halves™ program makes communication about money fun, utilizing workshop exercises inspired by improv comedy. It introduces couples to these concepts and asks them to connect their communication styles with one another. Couples put these into action by brainstorming ideas around current tension areas in their relationship. The Better Halves™ program material promotion will be available Thursday and Friday at the brightpeak financial booth — #64 — on the main concourse and during the Labs on Wednesday. brightpeak will have a Catalyst One-day Trip promotion, a Better Halves™ Small Group Kits promotion, and an additional promotion on all Better Halves™ materials purchased through October 16.
brightpeak financial (www.brightpeakfinancial.com) is on a mission to empower young Christians to live stronger financially so they can experience confidence and practice generosity. It is a new division of Thrivent Financial (www.thrivent.com), a faith-based not-for-profit founded more than a century ago. As a financial services company, brightpeak delivers financial products and services to young Christians in ways that equip and compel them to be financially smart, healthy and make a difference in the world. Thrivent Financial (www.thrivent.com) exists to create financial strategies that help Christians be wise with money and live generously. 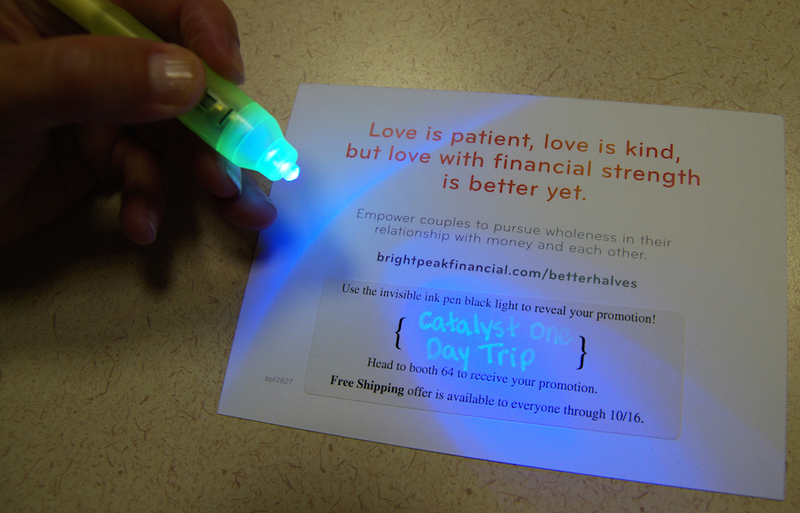 brightpeak financial is launching Better Halves™ (www.brightpeakfinancial.com/betterhalves), an innovative, holistic approach to family financial education that utilizes invisible-ink pens and black lights to help couples better understand the emotional and spiritual dimensions of their finances, at the Catalyst Conference in Atlanta Oct. 7-9. To schedule an interview with a brightpeak representative, contact Ty Mays at 770-256-8710 or tmays@inchristcommunications.com.